To take a color image, modern digicams have something called a Bayer pattern – small red green and blue filters, one color for each pixel – that drastically reduce the resolution if all you’re doing is taking black and white pictures. [Lasse] is an astrophotographer, and doesn’t exactly need color pictures, so he decided to swap the color sensor in his camera with a monochrome CCD. 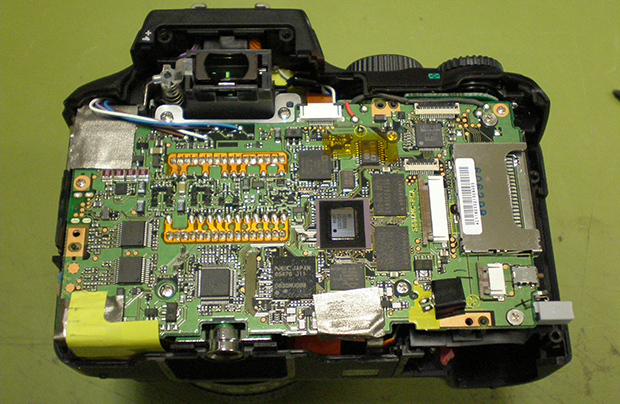 Most DSLRs have CCD sensors on strange surface mount packages or put everything on flex PCBs. [Lasse]’s Olympus E-500, though, features an 8 Megapixel CCD on a ceramic DIP that is actually fairly easy to remove given the right tools and just a little bit of mechanical encouragement. After putting in a new monochrome CCD, [Lasse] had a much more sensitive sensor in his camera, and processing the RAW files off the camera gives him a great improvement for his astrophotography. This isn’t [Lasse]’s first adventure in tearing apart DSLRs for astrophotography. Earlier, he uncovered the secrets of the Four Thirds lens format with a logic analyzer, making his Olympus camera a wonderful tool for looking into the heavens. It’s always interesting to see what will come out of a hacker meet-up. At the Observe, Hack, Make festival earlier this month [Bertho] was talking to a guy named [Erik] about how flip-dot displays work. [Erik] mentioned that the control theory is the same as core memory. So when [Bertho] got back to his home workshop he started playing around with it to see if a flip dot display can be made to behave exactly like core memory. We’re really glad a successor to core memory was found since it’s pretty slow. But the concept still makes for some fun exploration (here’s the obligatory Arduino implementation of core memory). It uses magnetic rings with two conductors running through them that pass at right angles to each other. Sound familiar? This is exactly how flip-dot displays work. There are, of course, some differences. The biggest one being that the displays don’t have the sense wire present in core memory. That was an easy enough thing for [Bertho] to get around. He added the grey sense wire by threading it through the inside of the hardware. The other hurdle he had to overcome was to alter the controller firmware to match the destructive tendency of core memory (reading the state also resets it). So far he’s just set this up as a proof of concept, reading the sense wire while repetitively reading and writing to the “memory”. But it’s engaging to see what was captured on the scope. We asked him about his future plans, specifically what he would use to automatically read from the sense wire. His response is found after the jump. It’s official. [Notch], creator of Minecraft, has confirmed he’s shelved plans for 0x10c, the space-based block building and exploration MMO that features assembly programming as a core game component. Over the last year or so since 0x10c was announced, a whole lot of programmers have picked up the in-game fictional CPU – the DCPU – by writing emulators and even emulating this CPU that only exists as a design document on an AVR. Needless to say, there are a lot of very skilled programmers that want this game to exist. Now, it seems, this community is forging ahead with this project without [Notch]. This is a truly massive undertaking by the community. Not only are the current plans to build an open world, procedurally generated, space-based MMO, it looks like these new developers will also be writing their own engine from scratch. If this were a commercial endeavour, it would require millions of dollars and many years to get to a rough alpha build, and the 0x10c community is doing this for free. If you have experience in C++, OpenGL, and 3D game programming, the official signup thread is over on the 0x10c subreddit. Even if you’re not a programmer and only have experience in modeling, writing, your experience would be greatly appreciated. Take one look at the front fork of this dirt bike and you’ll notice that it’s not really a front fork at all. A custom front end replaces the traditional design in order to give this motorcycle all wheel drive. Look closely and you’ll see the chain that drives the front wheel. The swing-arm like addition lets the front end retain all of its suspension and steering and that’s where the project gets tricky. We actually saw this thing in person at the monthly meeting of our local hackerspace: Sector67. [Martin Lawson] got his seven minutes of fame during the presentations (they use a prototype of this scoreboard to limit each presenter), and then was mobbed with a ton of interest afterwards. We were able to get a pretty good look at how the front drive works. It starts with an additional cog fastened beside the one that drives the chain for the back end. This feeds up through some tensioners and transfers out on the left side (from the rider’s perspective) of the front end. From here the rotational force is transferred to the right right and includes a U-joint to account for steering. The last chain goes straight down to the wheel. The idea is that when the rear wheel loses traction you’re still being pulled by the front. This is illustrated well in the video after the break. [Marty] — who has a patent on the design — is trying to get some interest from manufacturers. He says the ability ride right through poor traction terrain make this a lot easier than a traditional dirt bike for beginners to ride. But it’s obvious the professionals are having fun on the thing as well! Segments rise from a sheer white surface to reveal the time in this papercraft digital / analog clock build by [Jacky Mok]. New York-based designer [Alvin Aronson] is responsible for the original, titled “D/A Clock,” which he built as a student at RISD using Corian instead of paper. [Aronson]’s design is also massive in comparison. It measures one meter wide by a half meter tall. Without access to either a 3D printer or to a laser cutter, [Jacky] instead reduces the scale of his interpretation and relies on cardstock as the primary construction material. His experience with papercraft typography leads to a design that anyone with an Exacto knife and a slice of patience should find manageable. [Jacky] ignores the Exacto option, however, and cuts his pieces with a tool we saw earlier this year: the Silhouette Portrait. The clock’s electronics include an Arduino Uno, a servo motor controller, twenty-eight servos and an RTC breakout board that handles timekeeping. Each servo drives its own segment by sliding a paperclip forward or backward inside a small, hollow aluminum rod. Though we’re still holding out for a video of the finished papercraft build, you can watch a video of Aronson’s original clock after the break and see what inspired [Jacky’s] design. Need another clock to envy? Last month’s build by [ebrithil] uses twenty-two servos to individually spin the segments. If you prefer that your clocks light up, [Aaron’s] o-scope transformation has you covered.